New exhibitions are as common as snowflakes in Sydney during January. The gallerinas must know where their business comes from, and assume it's all gone to the beach for the month. It's a shame as a surfeit of leisure time could be nicely and slowly filled in gallery precincts. 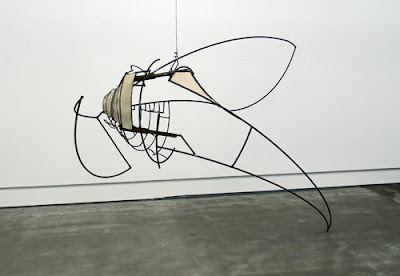 'Sculpture 2010' at Brenda May Gallery is a pleasing, yet modest, start to the year. In this smallish space in Sydney's Danks Street this group show is both thoughtful and eclectic, bringing together some very different artists without the heavy hand of a curatorial theme. In one of the two main spaces there is an awful lot of iron and steel to be seen, but that should not discourage, the show eschews stock standard municipal rust for something more intimate. Corrigan Fairbairn's large, delicate, 'Transitional Curvature' almost writhes into the space of the gallery. A series of intersecting arcs of steel rod is both delicate and muscular and hence evokes insects and flying machines, where power and weightlessness coexist. The ragged canvas stretched like taut flesh between rods and the mannerist twist it takes around a central axis makes the piece feel like it is in the process of birth, searching for a final form. It isn't formally innovative, just beautifully conceived. Too often sculpture, through its sheer presence in space, promises much more than it delivers. Intrigue is sacrificed for impact. Not so in Susanna Strati's 'Vale'. Twenty four hours have gone now and I still find myself wondering about its meanings. 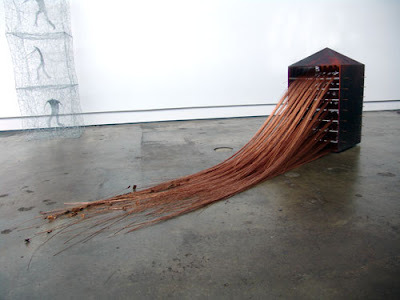 The piece is disarming if only for the fact that its houselike box seems to hug the ground, on which are draped a cascade of copper wires, some ending in perfect small leaves. The burnished steel box is covered in a half recognised script, a secret handwriting that might come from love letters, whilst inside there are perspex shelves that, at one end, are walled in with plates with repeated ghostly portrait photographs. The piece keeps its meanings and intentions to itself, you wonder whether the wire is sucking in the world or laying it down, whether there is a message in the marks or whether it's an illiterate scribble. It brings to mind nothing short of memory itself, the memory palaces of the renaissance or a Freudian puzzle. That might explain the hints to Louise Bourgeois or Susan Hiller's 'From the Freud Museum'. In either case the work gives the sense that memory is as much about creating as curating. 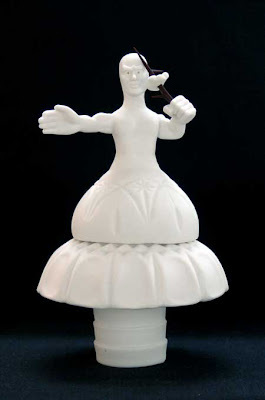 The idea of curating is also present in Daniela Turrin's 'Cabinet of Curiosities'. 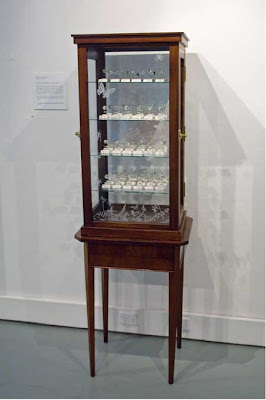 The conceit is simple, a museum display case is presented enclosing a precisely labelled and pinned scientific exhibit. Given the Latin name 'Pluvia Australis' this is a case of raindrops, of the type once seen in Australia. This might seem a glib comment on drought but the simplicity and the sheer beauty of the perfectly blown clear glass droplets is disarming. The scientific labels, identifying cloud type and the seeds they nourished have a deathly forensic precision. This is a meditation on loss, on how we categorise what has gone. It's quite lovely. Whether intentional or not there is an elegiac tone to much of the work here, which builds into a quiet power. 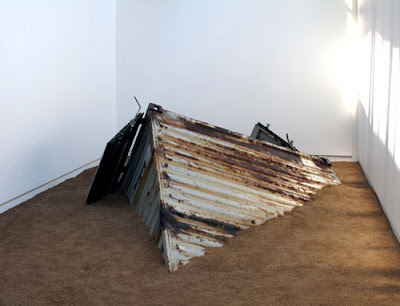 The dominant piece, in size at least, is Gary Deirmendjian's 'Hollow Promise', quite simply a steel shipping container that seems to have been submerged in earth and sand. In this plain white room it really is quite touching. There is just enough container left, its angle just right to suggest a gradual slippage and ultimate drowning. The work plays with the area between solidity and fragility, between the eternal and the ephemeral. It's power comes, like still life vanitas, from our innate knowledge that all that is concrete eventually melts away. In an Australian context one cannot help but think of Jeffrey Smart's industrial subjects, more broadly I was reminded of the touching final frames of 'The Planet of The Apes' when Charlton Heston discovers the Statue of Liberty half buried. The new year often brings with it an urge for self-examination and a weighing up of priorities, perhaps that's why such an understated show of this can speak so persuasively. There are works here that transcend sculptural cliches and send us searching within ourselves. It's a good beginning.